How do I add an email address to the BCC/CC fields? 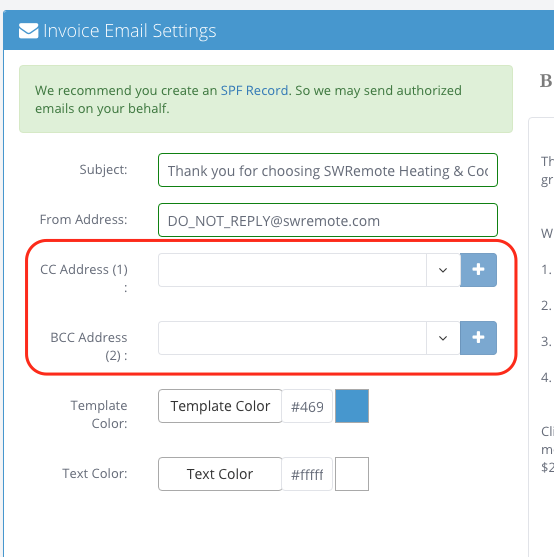 With the update to SWRemote 3.5.5, the BCC field will now automatically send an email to whatever e-mail is stored in our BCC field when a job is completed. This no longer requires the technician to email a receipt to the customer in order to trigger a copy of the invoice being sent back to the Office. Please note that this will NOT e-mail the Customers on file, the technician will still need to press the send button in order to send a copy of the invoice to the customer. 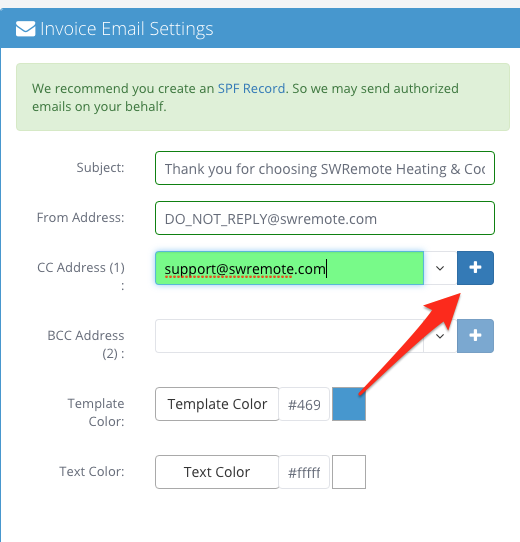 However, the CC field will only send an email back to the CC field if the Tech Triggers the email to send from SWRemote, and therefore to the customer as well. Wheather you have just the CC or just the BCC field filled in on our Admin site, an email will not get sent to the customer unless a Technician manually sends it. To add an email to either the BCC/CC field you must first type a valid email address into one of the text boxes. If the address is not valid/complete the box will turn red. Once a valid email address is in the box, the background will turn green and you will then be able to push the '+' adding it to the list of BCC/CC email addresses to be attached for each invoice. The number listed in parenthesis next the "CC Address:" and "BCC Address:" are the number of addresses you have listed for that field. To view the addresses attached to invoices you can click the down arrow and they will be listed. next to the desired address. To have any changes take hold on the devices, please have the technicians Force Close SWRemote and log back in.